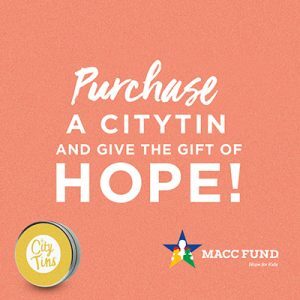 Purchase a CityTin and give the gift of HOPE! The 2018 Holiday Season is here and CityTins has once again stepped up to help the MACC Fund fight childhood cancer and blood disorders! $10 from EVERY CityTin sold through the MACC Fund’s link between October 24th, 2018 and December 23rd, 2018 will be donated back to the MACC! The process to order has been changed this year, and is very simple!! Follow these easy steps…. CityTins make GREAT gifts for family, friends, clients, and co-workers. The “Tin-ventory” this year is awesome, and has been EXPANDED!!! 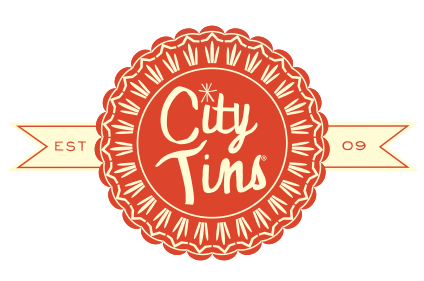 In addition to Milwaukee, Madison, Fox Valley, and Cedarburg areas, CityTins now includes Lake Country and the Twin Cities!!! Thank you for purchasing your CityTins in support of the MACC Fund this year! $10 from EACH CityTin purchased will be donated back to the MACC Fund!